For some, the idea of going to a dentist appointment can be nerve-racking. According to a study by colgate.com, it has been estimated that between 9%-15% of Americans avoid going to the dentist due to fear and anxiety. To put that into perspective, that’s about 30-40 million people. With this to contend with, it is critical that dentists not only have excellent bedside manner but that they are successful in their marketing strategies. Custom business cards are the foundation of every successful business. At Primoprint, we offer a diverse array of printing options and high-quality paper stock. Our superior paper stock comes in 14PT, 16PT, 18PT, 22PT, and 32PT, and it can be styled with Painted Edges, Inline Foil, Plastic Cards, Linen, Spot UV, Full UV, and more. Primoprint business cards are also available in Velvet Laminated, Linen, Oval, Slim Cards, and Square Cards, featuring rounded or square corners. You can be unique and have a plastic business card! Make sure to tailor your graphic design to your clientele base. Do you have a practice in an upscale metropolis? 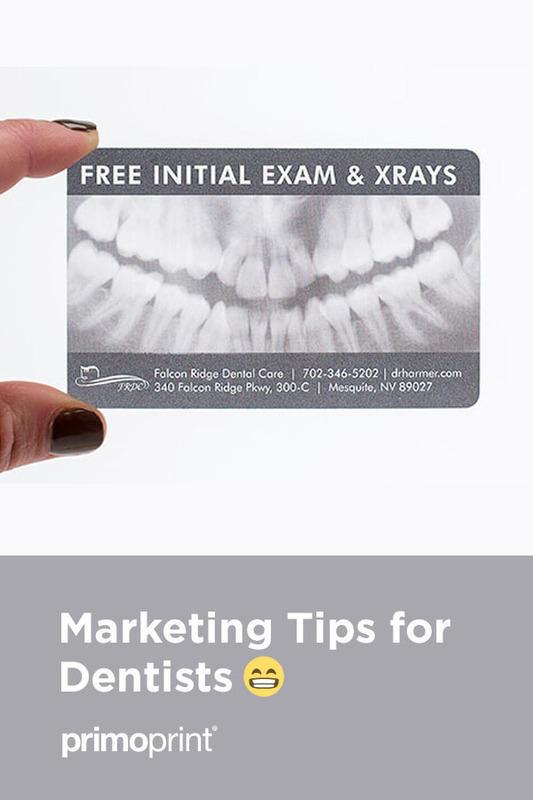 Make sure that your dental business cards come across classy and sophisticated. Or, do you work mainly in pediatric dentistry? Use artwork that comes across as cheerful, perhaps with animated characters or brighter colors. In a 2015 USPS® Household Study, researchers found that 81% of recipients read or scan their mail daily. Every Door Direct Mail®, or EDDM®, is a marketing channel in which companies send postcards out to a targeted zip code or area. EDDM® is also a perfect medium to advertise business details and incorporate coupons for dental products or services. Choose from Glossy UV Coated, Matte, or Spot UV Gloss in 11 standard postcard dimensions, printed in stunning full color, single or double-sided. Not familiar with EDDM®? Watch our Route Selection Tutorial and learn how easy it is to reach potential customers by selecting USPS® routes or zip code(s). Custom stickers are a great branding tool, especially for young children as a reward for good behavior during their visit. We offer crack-n-peel stickers with a Glossy UV Coating or with Inline Foil, and Short Run Crack-N-Peel stickers with no additional coating. Custom shaped roll labels like those shown in the image below are sure to put a smile on your young patient’s face. 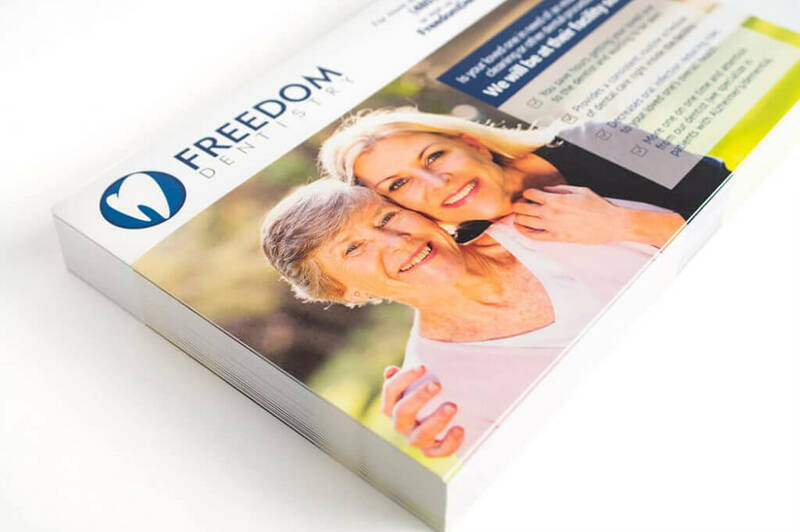 Business Brochures are ideal handouts and sales pieces, giving you a trifold canvas to efficiently and effectively share your practice’s information along with your various services. We can provide your marketing materials the pizzazz they deserve with our Gloss, UV Coating, Satin Coating, or Uncoated Paper finishes. We offer 70LB, 80LB, and 100LB paper stock. Leave your clients with a unique yet practical marketing reminder. Post it on your refrigerator, inside your locker, or on any metal surface. Our indoor use magnets are printed in full color (CMYK) single (4/0) 17PT UV coated card stock and are available in a variety of shapes and dimensions. It’s easy to make a statement with printing magnets for your business. Bookmarks are more than just a practical placeholder; they’re a potentially informative canvas. On one side, you can advertise your practice. On the other, the opportunities are endless. If you’re targeting children, list fun facts about your state, feature the top five most commonly misspelled words, or list three riddles for them to decode. For an adult client base, list the dentist’s favorite dental hygiene products with the most cost-effective prices in town, a list of the staff’s favorite books, or a discount for their next visit. Choose from our high-quality 14PT or 16PT stock and a variety of dimensions and finishes, including Matte, Glossy UV Coating, Spot UV, or Uncoated Card Stock. Perhaps one of the more creative ways of marketing, hang tags are the perfect size for you to place your logo along with key contact information. We offer a diverse selection of sizing and printing options, including Matte, Full UV, Spot UV, Silk, and Inline Foil, with the option of printing on 16PT or 18PT premium card stock.